Spring Break is a great time for a dive into STEM skills! 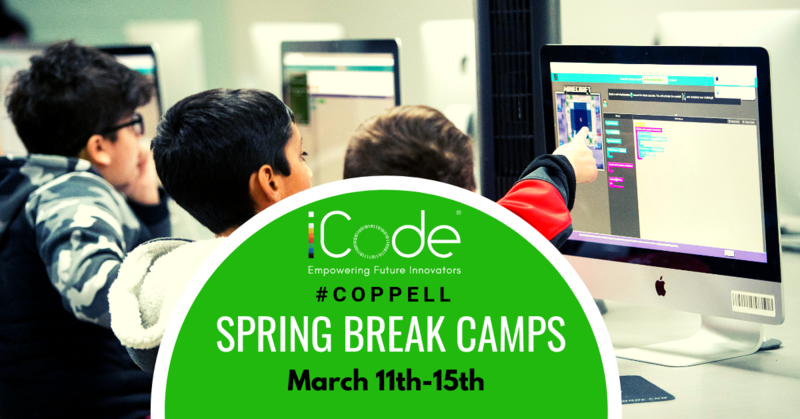 iCode's camps provide fun and learning during school breaks. Existing students practice course skills in a collaborative environment, thereby enriching their learning experience. Students who are new to iCode gain an excellent sneak peek into iCode's curriculum. Students build their own robots and learn the basic science of programming the machines of the future - today! Using Lego bricks students will learn about simple machines, be able to Program and create a working model, interpret 2D and 3D illustrations, modify the models behavior by changing the mechanical system, understand the relationship between sensors and feedback. Student will work in teams to brainstorm to find creative alternative solutions and share ideas. Students will learn about Digital art as an artistic work or practice that uses digital technology as an essential part of the creative or presentation process. Student will learn how to do 2D and 3D modeling and how to use Code to make interactive art. This camp is a unique blend of art and technology. In an age of technological outburst it is crucial to know that art and design play an important role in realization the high-tech world around us. We will learn about various ways in which we can innovate. Students will be introduced to basic flight mechanics and aerodynamic principles to understand how to code and fly a drone. The student will develop an understanding between software, hardware, and the individual. Program, plot your course, and takeoff!